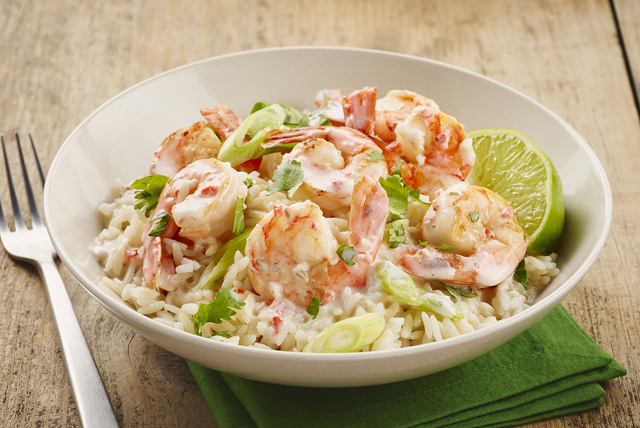 A lime-scented, flavourful coconut sauce coats these shrimp for an Asian-influenced stir-fry. And since this simple stir-fry is so easy to make, it's the perfect recipe to serve any night of the week. Cook garlic in dressing in wok or large nonstick skillet on medium heat 2 min., stirring frequently. Stir in coconut milk and half the onions. Bring to boil on medium-high heat; simmer on medium heat 5 min. or until thickened, stirring constantly. Add shrimp; stir-fry 2 to 3 min. or until shrimp turn pink. Remove from heat. Stir in cilantro and remaining onions. Serve with rice. For a change of pace, prepare using thawed frozen sea scallops.